Winter is coming and chocolate too! Mid November and suddenly chocolate projects everywhere and even as a RPG and fantasy fan you can’t avoid the chocolate. At least I came across some cool projects made of chocolate. Håkan Mårtensson, a Swedish chocolatier made a chocolate Gollum and various other great sculptures out of chocolate, have a look at his works at his gallery. Second is a chocolate DIY instruction, to create your own chocolate dice. D4,D6, D20 any dice you want. The effort when following the instruction, seems worth it, yummy. Some of you might immediately get the connection between magic in Earthdawn and the Mayan calendar. Nevertheless I want to give you a small insight on how the magical circle in the Earthdawn universe works and what this all got to do with the Mayan calendar. So did you ever wonder why there is a Mayan calendar as a background on the 3rd edition sourcebooks covers? That is because this calendar is strongly connected to the world and the age of Earthdawn, also known as the “Age of Legends”. 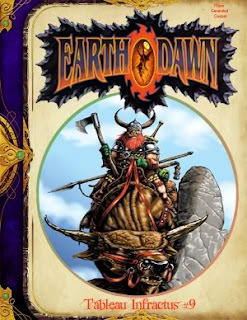 But to provide a complete overview we got to remember that Earthdawn is/was not alone since it was “invented” in 1992. It was Shadowrun that existed first and Earthdawn was intentionally developed as a preceding world of Shadowrun. Earthdawn plays in the same universe as Shadowrun but a long time earlier whereas Equinox is taking place a long time after Shadowrun. Depending on the level of magic, the world is formed and influenced differently. At a high magic cycle for example, horrors can enter the world. The magic, in all those settings is in a permanent flow as the tides are. But the cycles of these “ups” and “downs” of magic are not measured in days, weeks or months……..guess it…….yes they are measured in “Ages” and that’s the point where the Mayan calendar comes into play. Short Count calendar: The Short Count was used for measuring short periods of time. It consisted of 260 days, divided into 13 periods (20 days each). Long Count calendar: The Long Count calendar was used mainly for measuring longer periods of time and events that happened a very long time ago, or will happen very far into the future. Maybe a this video explains the functional principle of the Mayan calendar better. * the Mayan calendar works in a more complex way as I described here. For more have a look at wikipedia or at howstuffworks. Strongly connected to the Ages is the magic flow and for Earthdawn this had tremendous consequences. Earthdawn, the 4th age, the Age of Legends or the 4th world (as some Shadowrunners call this age) has to deal with the rise and fall of the magic level. The rise of magic allowed horrors to enter the world at the peak of the magic level (and even before). The scourge started and the horrors “ruled” the earth and the Namegivers hid from the world. After 300 to 400 years (to be exact in 1415 Throalic time = TH) the level of magic stopped to decrease. Look at “In-game measuring of the magic level” to read about how the Namegivers knew that magic stopped decreasing. The Mayan calendar starts at the 11th August 3114 BC and one cycle of the Mayan calendar takes about 5200 years. That’s why a lot of doomsters and conspiracy theorists predict the end of our world as we know it for the 21st or 23rd December 2012, when the long term cycle of the Mayan calendar ends. Which is also called the 2012 phenomenon. This means for Earthdawn that we can almost exactly date back to the start of the plague or get the real time dates of the Throalic timetable. The Sixth World (Shadowrun) starts on December 23rd 2012, with a rise of magic. Dating back to the end of the 5th World we land at 3114 BC, the start of the Mayan calendar. The plague in Earthdawn started when the level of magic was at its peak: ∼5200 : 2 = 2600 –> 3114+2600 = ∼5714 BC. The Namegivers hid for about ∼450 years (for example Throal was closed from 1050 TH until 1420 TH) in their Kaers, so we subtract 450 years from 5714 BC = 5264 BC. The opening of the Throal gates in 1420 TH would be equal to the real time date of ∼5264 BC. NOTE: All that subtracting/dividing of numbers and so on is based on rounded, not exact dates. I just want to provide a calculation that is easier to understand. Between the Age of Dragons, Age of Legends and the Sixth World was a long time of a down cycle when magic decreased. The magic in Earthdawn for example reached its peak at the time of the scourge. Often questioned in some forums: “How were the Namegivers in Earthdawn able to find out when the scourge ended?”. They had something that was called the “Elemental Clock” or “Dish of Water”. This device allowed to see if the magic level had dropped. Those kaers that hold copies of the Throalic Book of Tomorrow know the magic ritual that will tell them when they may safely re-enter the world. Those lacking this ritual must guess and hope. The magic itself is basic: a simple ball of True earth is enchanted and placed over a dish of True water. The magics of the ritual keep the ball suspended over the water. As the strength of the world’s magical aura wanes, and the Horrors are forced to retreat, the ball of True earth descends until it finally touches the True water and the two mix. All across Barsaive, the people in the kaers watch the ball descend. Slowly, ever so slowly, it drops toward the water. Finally, in the fourteen hundred and fifteenth year of the Throalic Calendar the ball stops falling, hanging an inch above water. Shocked scholars and magicians watch in wonder and dread. It is too soon by hundreds of years for the Scourge to have abated. And why had the ball stopped? No one knew the answer then, and no one knows to this day. A lot of tales and myths are told amongst fans, developers and I guess even most magicians of Barsaive, speculating about that weird issue. Forum discussions can be found here. Have a look at the thesis of Ben Harff: a handdrawn "Edel-Silmarillion" book! RedBrick LLC hasn’t announced it on their page yet, but Annunaki has spread the news on the pinnacle forum. Pinnacle Entertainment Group and RedBrick LLC are both pleased to announce that RedBrick has joined the ranks of Savage Worlds licensees! RedBrick publishes game products for FASA's Earthdawn™ and Demonworld™ fantasy games, Holistic Design's Fading Suns™ space fantasy game, and Biohazard Games' Blue Planet™ science fiction game, as well as RedBrick's forthcoming Equinox™ space fantasy game. Well it is not only Earthdawn that will come in Savage Worlds’ shape, but what can I tell ya have a look at the things Zorhau found out as he digged deeper and asked some questions. He posted the received answers on the German Blutschwerter forum. But these are still not all the news. Spoilers everywhere!!! Nice try Dammi to get the monthly spoiler award after telling us about the planned books of RedBrick in your blogpost “A Glimpse of the Future”. The award goes to Annunaki, it’s as simple as that. Again I am very happy that the story of Daylen Jagaro will fill another book. In our interview about the second novel „Immortal Twilight", you told us that the idea of the sequel came when Jacques Marcotte made an offhand comment about how the story could develop. Did you need such a push again for writing the third novel “A Forgotten Tomorrow”? Or was it clear after "Immortal Twilight", that you had to write a third book? The basis for the third book came about during the writing of the second. The complete story couldn't really be told in just the second book, and I was already writing down notes for the third while writing the second. Will the third novel of your Cathay saga be the last? Or were you planning to make it a quadrology? Yes, it's set to just be a trilogy. The outline has been finished for a couple years now. Only the prologue has actually been written at this stage, however. Assuming that the main characters of the previous two novels, like Bik-Bik, Su Shen and Bei, will still play a big part in „A Forgotten Tomorrow", who else will step on the scene? There will be some cool new villains (as well as some old ones) that are part of a new secret society. There will be a Samurai character involved, whose own quest is tired up with the quest of our main cast, and Bik-Bik will get to meet someone special… In addition, the Ka-Li dragon and what that represents will be explored more fully (which can, in a way, be interpreted as a character, I suppose), and another famous character from the first novel will return (there is a clear tie in with some elements that were set up in the first novel, bringing the trilogy full circle). This third novel will be the first released since the Cathay sourcebooks are on the market too. Do you now go deeper into the land and the culture of Cathay (if even possible) or do you pick up some stories that are told in the sourcebooks? Did the sourcebooks influence or change your writing? The sourcebooks were written first, and in that way, I guess they influenced my novels. The novels really are just magnified moments of Daylen's life as he was writing the sourcebooks, before returning with his journals to the Great Library back in Throal. When you look back at the two previous novels, „Dark Shadows of Yesterday" and „Immortal Twilight", is it hard to end the wonderful journey of Daylen Jagaro? Did you expect to get him that far when you started to write the first novel? Well, there are still many tales left for Daylen Jagaro. Whether any of them will be told is a mystery, but the Cathay trilogy really only covers his adventures with Su Shen and Bei. There is a year gap between the first and second novels, and a 6-month gap between the second and third. That's a year and a half total of adventures just waiting to be told. If the Earthdawn novels ever pick up steam and go into a more widespread production, it would be fun to add some of these little tales to some anthologies, or better still, get other authors to tell some of these mini stories of Daylen and Bik-Bik (which would be a lot of fun for me to read). But unfortunately, it doesn't look like the publishing industry is heading in that direction, so it's likely “A Forgotten Tomorrow” will be Daylen's last, but you never know. On a side note, if a Jih'Poh sourcebook is ever written, I'd like it also to be from Daylen's POV (whether or not I'm the writer on that or not). In the meantime, keep an eye out for my upcoming Earthdawn adventure Lost Dynasty, which I wrote back in 2004 and delves into the ancient human kingdom of Landis. What can you already tell us about the story of the third novel „A Forgotten Tomorrow"? What about Yen-Li and his "comrade"? Well, without getting too spoilerific, the third novel will be set 6 months after the events in Immortal Twilight. Yen-Li and his comrade are the main antagonists, but there are even larger powers at work behind the scenes. As I already mentioned, a new secret society with new colorful (and powerful) secondary villains will be introduced, as well as some new characters to travel alongside our heroes. By the beginning of the novel, Daylen has become a bit of a philanthropist, traveling Cathay in hopes of learning as much as he can about Cathayan culture for the Great Library back home and trying to help those affected by the war whenever he can. Of course, the villains still have their own goals, and poor Daylen gets swept right back up in it. The story will also hearken back to events in the first novel, shedding light on events that transpired there and adding new twists to the tale. The first two novels were released in 2008 and 2009. Considering that you had to work on the Cathay sourcebooks too, I ask myself when you could possibly finish "A Forgotten Tomorrow". And then there is RedBrick, always cautious spreading release dates, but when do you hope to get the novel published? Well, I'm not exactly sure when I can get around to it. The Cathay sourcebooks were actually finished before the first two novels (the drafts were handed in back in August of 2005). I haven't had as much time in the past couple of years to do much writing because of my day jobs. I had worked a temporary stint with Paizo Publishing back in 2009, helping with the big launch of the Pathfinder Roleplaying Game, then did some contract work with Microsoft and Expedia before finally landing a permanent gig with The Pokémon Company International. During all of that I was running a Pathfinder campaign for some friends (still ongoing); freelance writing, editing, and designing for both Earthdawn and Pathfinder; and somewhere in there somehow managed to get married and write and sell a screenplay for a straight-to-DVD network movie (to start filming in June 2012—won't say for who or what network though, since that's secret!). Nowadays, though, I'm mainly busy with family obligations and my day job. Working for Pokémon is the best career I could have hoped to have landed (I actually just made the transition from contract to full time earlier this year), and while it's a lot of fun, it's also very demanding. In what little spare time I have (and trust me, that's not a lot), I try to enjoy my hobbies (including the Pathfinder campaign I'm running and an unpublished, "just for fun" play-by-email strategy wargame I designed based on George R. R. Martin's A Song of Ice and Fire series), study Japanese (my wife is from Tokyo), and maintain some semblance of a social life. It will get finished someday, though. The dust from the chaos of the last two years is still settling. Once I get some time, I'll be plugging away at it chapter by chapter, posting them up on RedBrick's developer forums for the team to dissect bit by bit. It will be much slower going than the previous two, especially since it might be a big longer as well, but in the end, it will be worth the wait. I'm already finished with the Prologue, and the team has had access to it for some time, so the process has already begun. I thank you for for the interview and I’m looking forward to hold the third book in my hands, someday. The Cathay pictures of this post were used with kind permission by RedBrick and can be found at their Download Section. Great idea by Sebastian Bergne. Almost as great as the D20 mace. Well I put together a download section to lead you to most of files and documents I reported about on the Earthdawn Blog. Unfortunately I had to remove the “Interviews” section in the header. But the interview category still leads you there. I hope this makes it easier to discover old entries with downloadable content which might be hard to find on the blog. Last time I wrote about the Earthdawn Character Editor it was in version 0.1 Alpha. Lortas (interview) and his crew recently released version 0.27 Alpha and so we will take a look at the development. Of course I can’t talk about all proceedings comparing v0.1 and v0.27, detailed information awaits you below at the change log listing. So let’s have a look. 6 sample characters were added, to show you the full potential of the Character Editor. At the “Experience” tab all the Legend Point you spend will be recorded. Screenshot taken from the sample character Jada Denairastas. The best feature in my opinion is of course the export function to various PDF sheets. Note: the blank editable Ajfel+Mordom sheet is available here. The Character Editor is still in development and you can be sure that further updates will be released. Lortas has set up a “What’s happening” page where recent progress information is provided. The so far released versions can be found here, together with a readme file including the current change log. If you want to support or contribute, programmers with some knowledge in HTML and CSS are welcome. Simply contact Lortas. The upcoming version 0.28 will contain some incompatibilities to older versions. The release of version 0.28 is scheduled for the next weekend. Lortas will release a tutorial to fix those incompatibilities on his HELP FORUM. The maximal circle for disciplines is now reduced to 15. - The column for LP based raising of attributes is renamed from "circle" to "LP increase"
- The element "portrait" has now the attribute "contenttype"
Where could generators be better found than at the Generator Blog? Are you a fan of the George R.R. Martin „A Song of Ice and Fire"-books? Look at the Inn at the crossroads blog, they (Sariann and Chelsea) write about the meals of the books and post recipes of them. HUNGRY! The Conjuring Arts Research Center (vimeo). One of the biggest collection of historic books about magic, wizardry and illusions. We first started playing Earthdawn without figurines. It never occurred to us to use 'actual' minis. We did use counters and white board squiggles and maps. After years of playing, our GM was given a box of Warhammer Orcs for his birthday and he found a love for painting miniatures. He then bought the Descent series of Dungeon Crawl board games and set to painting the minis from them. With all the work that went in, we started using the minis as our tokens for our Earthdawn Campaign. We upgraded our table to include a hex map and accepted the challenge of finding Earthdawn miniatures so that we had better representations of our characters, particularly because of the size differences between trolls down to humans down to Windlings. Our GMs wife, with a black belt in Google-Fu, was asked to search the WWW and find representations of our characters. Windlings - The 10mm figures at http://goo.gl/a2GNQ would be great for Windlings. The only race we have had trouble finding miniatures for entirely is Obsidimen, although Trolls are not the easiest to find either. If anyone has any suggestions, they would be greatly appreciated. Then a new challenge was presented as RedBrick produced the Cathay Series in Earthdawn. After having played with our Barsaivian minis for about a year, we knew we HAD to get some Cathay Minis BEFORE we started their Campaign. Still not decided on races and disciplines we were all going to play, we did a general search for all Cathay related characters. We are going to remove the bladed weapons and he will become our Pugilist. Will post a pic once we are done. http://www.agisn.de/html/asian_miniatures.html who have a few links to sites where they got their minis from. This Human Swordmaster (Axe-Master) is from here and axes from here. This Human Cavalryman (Amazonian Woman type) is from here. This Troll Skyraider is made up of this mini (perfect size for ED Troll). I shaved off the skull in the front of the armor. Added some Warhammer Black Orc horns that came in this set. This Human Nethermancer is from here. The wings are Manticores wings sewn onto a cloak. Wings from here and the tails are made with Green Stuff found here. This Windling Elementalist is found here. This Human Beastmaster is a combination of 2 mini's found here and for the arms here. CLAW SHAPE BABY!! This Elven Archer (with crossbow) is found here. This Dwarf Troubadour is a compilation (pun not intended) of this mini and his instrument comes from here. We are a dedicated group of Earthdawnians who call ourselves Lords of the Dice. This was the last entry of my Open Call for Guest Bloggers, I hope you enjoyed the articles as I did. I thank all participants, who did a great job writing those articles.